Poppyseed Dressing is my favorite dressing for salads. Truthfully, it is the only dressing I really like. Typically I just buy the Brianna’s Brand (It really is incredible), but recently went to visit my mom’s house where she had created one of the most amazing salads I have ever eaten. That recipe will come soon, don’t you worry! But, she didn’t have any Brianna’s on hand, so I quickly whipped up a batch of my own. My good friend Alyssa always raves about her poppy seed dressing, but I decided to change it up a bit to my liking. I have been on this lemon kick lately, and decided a hint of some fresh lemon zest would be the perfect way to bring a fresh flavor- and I was right. The lemon zest hit this dressing out of the ball park! The lemon was exactly what this dressing needed to take it to the next level. I also used some half and half instead of milk because I wanted it a bit creamier, but you can definitely use whatever percentage of milk you want. Obviously the more fat content, the creamier your dressing will be. If you wanted to make it skinnier- you could use fat free mayo and skim milk. 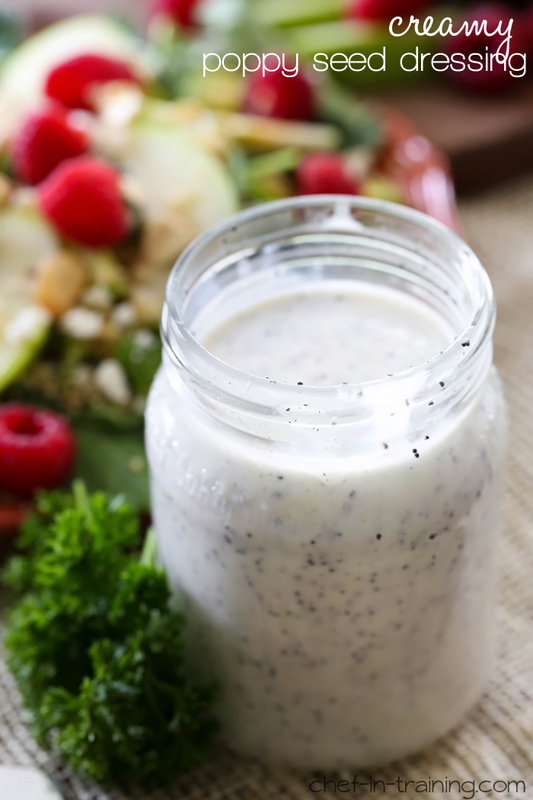 The best Poppy Seed Dressing! The lemon zest takes this dressing to a whole new level! Combine all ingredients together in a blender and blend until well combined. Poppsyseed is one of our all time favs! Your version looks delish. Pinning. Oh this sounds like so much fun and perfect for summer salads! I love the little addition of lemon zest, reminds me of a lemon poppy muffin! What a delish, creamy, and great looking dressing. Pinned! This sounds like it would be delicious on a strawberry and spinach salad. Do you think you could use Greek yogurt instead of mayo? Overall this was a good recipe. It was way too sweet for me. Next time, I make it I will add the sugar one spoon at a time. How long could you keep this dressing stored in the fridge or should recipe be adapted to just make the quantity you need fresh. I just made this making a healthier version with Greek yogurt and honey. It was spectacular! I LOVED the lemon zest. In fact, it was so good, I immediately made another batch! This looked so good-so I made it. But I was quite disappointed in the flavor. Too bland, too sweet, too much poppy seed...and I didn't even put as much sugar and seed as it called for! It just really lacked the yummy flavor that most dressings have, the kind that make salads pop.